As a former foster care student, Ruth Rios did not have the typical college experience. “I didn’t have the same tools that other college students had,” said Rios, 26, who graduated from FIU in 2010 with an undergraduate degree in exercise physiology and is currently pursuing a master’s degree in business administration at FIU. When she started at FIU, Rios did not have a car or a cell phone. If she needed to make a phone call, she would use a payphone. Even with financial assistance, which included a monthly stipend, Rios had to work two part-time jobs. A new program at FIU will provide former foster care and homeless students with additional support to assist them during their college careers. FIU celebrated the launch of the program, Fostering Panther Pride, during a donor recognition ceremony on Nov. 22 in the Graham Center pit. “This is a perfect example of a partnership and a commitment that is going to bring very positive benefits for individuals who we admire and treasure,” said FIU President Mark B. Rosenberg. FIU administrators and donors celebrate the launch of Fostering Panther Pride, a program to provide support to former foster care and homeless students at FIU. A total of $133,000 has been raised to fund the initiative. 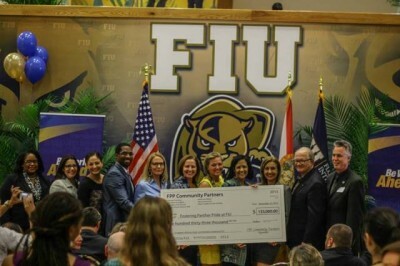 Representatives from, The Miami Foundation, Educate Tomorrow, the Miami Coalition for the Homeless, Voices for Children, the Office of the Provost and Moss Construction, which is run by FIU graduate Chad Moss, presented a check totaling $133,000 to fund the program. For FIU Senior Academic Bridge Advisor Brittany Janes, the new program has special meaning. A former foster care student herself, she began mentoring former foster care students on her own time in 2011. “This is a population that I have a lot of passion for because I’ve been there,’’ Janes said. Janes’ involvement in foster youth advocacy began when she was a graduate student at Colorado State University. She founded a program – Fostering Success – to help former foster youth by offering them mentoring and other support. FIU’s program has been nurtured by a committee of administrators and faculty with an interest in helping homeless and former foster care students. The work of the committee became the basis for Fostering Panther Pride. “It’s amazing because they are doing everything that I had a vision for,” Janes said. Dean Michelle Mason of the College of Law co-chaired the committee to bring the program to fruition. Through the program, students will be partnered with a college coach, who will will assist them with university resources, including financial aid, study skills and internships. Fostering Panther Pride will also provide mentoring, academic assistance and scholarships. 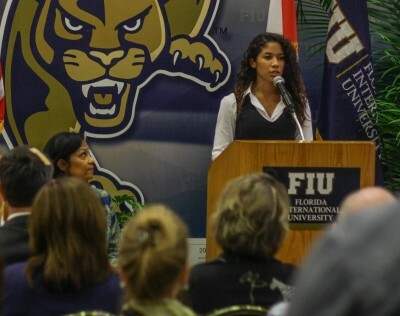 Former foster care student Ruth Rios, who graduated from FIU in 2010 and is now pursuing her master’s in business administration, shares her story during an event to launch the Fostering Panther Pride initiative. Marcus McIntyre, 22, is a sophomore majoring in criminal justice at FIU who grew up in an adoptive home. When he was told about the program, he was interested in helping. Josh Scott, 19, is a senior at Miami Northwestern Senior High School, who became homeless after his father kicked him out and he was evicted from the home he shared with his stepsister. He currently lives in a shelter. Scott attended the launch event for Fostering Panther Pride and said he believes the program will benefit students in similar situations as his. Nationally, the statistics for homeless and former foster youth paint a picture of the challenges this population faces. Less than 10 percent enroll in college and less than 1 percent graduate. Former foster care and homeless students at FIU also struggle. Of the 42 former foster care and homeless students enrolled at FIU this semester, one third are on academic probation with a grade point average (GPA) of less than 2.0. Fostering Panther Pride, which will be housed under Undergraduate Education, will provide support for graduating high school students who enroll at FIU by entering the Golden Scholars Bridge Program, a six-week summer transition program. Possible financial support for students includes $100,000 in scholarships over the next five years from the First Generation Scholarship Fund, which supports FIU students who are the first in their family to receive a college degree. For many of these students, accepting help can be a difficult task. Rios said she encourages students to step forward and ask for help. FIU helping former foster youth succeed.